In general I like to keep the nature of this post entirely random - or, in other words, I try to feature photos that do not share a specific theme among them. However, it is a rare occurrence to have Halloween fall on a Saturday and as such thought it would be wonderfully fun to fill this week’s Snapshot post with a trove of vintage images showing everyday folks, just like you and I, celebrating the once-a-year magic that is Halloween! Joyful, spooky, fantastic wishes to you each for a truly marvelous Halloween, my friends! Aww what an adorable collection of images! Hope you have a fabulous Halloween doll! Oh just fantastic photo's, I love the last one of the gorgeous girls and am totally smitten by the Hudson. These are great. Thanks so much for sharing them. What amazing photo finds! I just love the one of the little boy in the Columbus shirt with the pumpkin! Adorable! I love the Halloween Slick Chick Beauty Contest! These are awesome pics, I love the robots! I recieved your sweet letter and thank you soo much. I am so happy to find out more about you and all you like. I truly feel, I've found a friend and thank you for that. I love your picts today.. 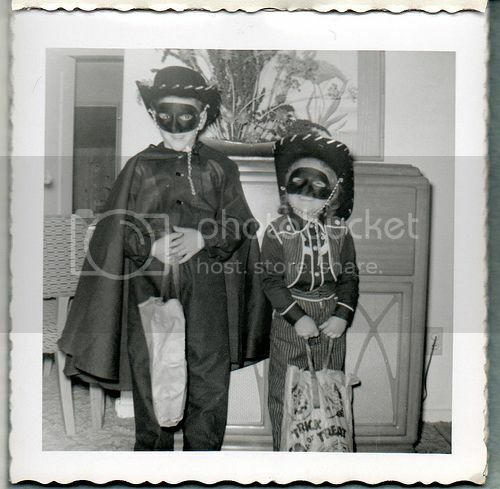 It reminds me of my brother and I trick or treating in 1967-68.. he was a vampire and boy did he look great. Thanks for always prompting a good memory for me.. have a good day.. and super big hugs today!! Hey there. Hope you've had a great weekend. I wanted to let you know that I've given your blog an award on the latest post on my Dino Lounge blog. I hope you like it. I love your blog. Cheers! These were great! I love the girl dressed as Mighty mouse in her jean skirt and red leggings! Wow, I love the woman on the porch and the very last photo of the four beautiful ladies! Gorgeous! I hope you had a wonderful halloween! I love all of those pictures ! Great pics. I love seeing all of the costumes and especially the children looking so excited for Halloween. I hope yours was fantastic! i came a cross that photo of the little girl sitting atop the pumpkins a few weeks ago on Flickr and have had nightmares about it ever since. yikes! Thank you deeply, everyone, for your marvelous comments on these delightful vintage Halloween shots. It was a joy to put this post together, digging around Flickr for a trove of "spooky" old school images to share with you. I hope that you each had a magically fantastic Halloween and that November will be an awesome month for you all!!! I hope you're having a wonderful Monday, honey!